There are many excellent downtown San Francisco hotels, ranging from large national chains to boutique hotels catering to niche clients. Room rates vary widely and are not necessarily related to the size of the room or the location of the hotel. Be sure to do your homework before booking your reservation. Union Square is a central shopping area with many of the City's luxury stores, historic hotels and kitschy specialty stores. From Union Square, cable cars and MUNI provide easy access to San Francisco's other attractions. In Union Square, you will be able to find a variety of hotels to choose from. The Chancellor Hotel is an excellent combination of the elegance of old San Francisco charm with the convenience of a prime location for both business and vacation travelers. The hotel was built in 1914 in the European style. There are 137 rooms and suites, all furnished with a special touch of elegance and comfort. The hotel lobby and rooms were updated in 2007, providing a contemporary feel to this grand old hotel. Guests can choose a specialty pillow from the hotel's pillow menu. The bathtubs are oversized - just the place to try out all the in-room spa products. Business travelers will enjoy the free Wi-Fi connections in all rooms, as well as the free phone calls. Boutique and large department stores are within easy walking distance, and public transportation is available at the front door. Rooms rates are very reasonable for this prime location at about $150 a night, and the hotel also often holds special deals. You can't miss the St. Francis. It is as much a landmark in itself as other historical monuments in the area. This hotel, in the heart of Union Square, blends elegance, history and modern convenience. 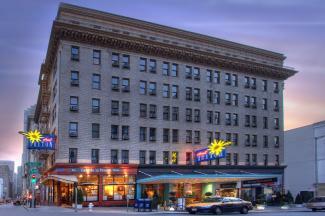 It is centrally located with Union Square across the street and the theater district just around the corner. Be sure to try the afternoon high tea service in The Oak Room in the lobby - it is one of the best in the city. Guests can receive spa services in their rooms, and the hotel offers a kids club to keep the little ones engaged. The hotel can be pricey, with rates starting at about $250 a night, but special packages are usually available through travel discounters. Walk into the Hotel Triton and be dazzled by the bright colors and vibrant decorations. This boutique hotel, just north of Union Square at the edge of Chinatown, often has musicians' tour buses parked out on the curb because many artists and musicians stay there. In fact, some of the rooms are designed by celebrities, such as the late Jerry Garcia and Kathy Griffin. This funky yet upscale hotel is close to great restaurants, bars and clubs, and it's within walking distance of North Beach, the Financial District and the Theater District. It is so pet friendly that its own resident dog, Romeo, may just greet you at the door. Rates start from about $215 and go up from there. But this hotel is owned by the boutique chain Kimpton Hotels, and the company often runs specials on its properties. Here's a hotel at a relatively reasonable price that puts you at the edge of Chinatown on Grant Street. The Baldwin is a newly renovated, European-style hotel. The cleaning staff fold the towels into animals and shapes (think towel origami) when they make up your room. The location is great for walking around to nearby attractions, to get to the Financial District or to get to Market Street, the Moscone Center or the Museum of Modern Art. Rates start from around $150, and be sure to use discount travel sites to get the best deal. 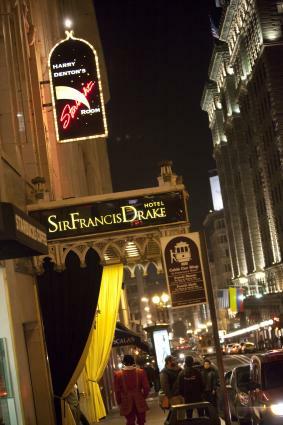 No guide to Union Square hotels would be complete without mentioning the Sir Francis Drake. This upscale hotel is a mainstay of San Francisco culture and history. The hotel's Starlight Room on the 21st floor provides sweeping views of the city, as well as a swanky atmosphere to grab a drink or keep a lookout for celebrities. The Drake has kept itself looking young with impressive renovations, and will keep you looking and feeling young with its wellness amenities, such as in-room spa services and a free yoga mat to use during your stay. This pet-friendly hotel will keep your dog as happy as you are, providing in-room dog treats, beds, and a city guide to pet-friendly restaurants and parks. You can book a room here for as little as $200. The eastern side of San Francisco is home to many of the city's financial powerhouses, and it borders the multi-building Embarcadero Center - a composite of offices, small shops, and a big selection of excellent restaurants. You'll want to check out the nearby Ferry Building while you're there for its shops and farmer's market, and be sure to take the less-crowded cable car up California Street. 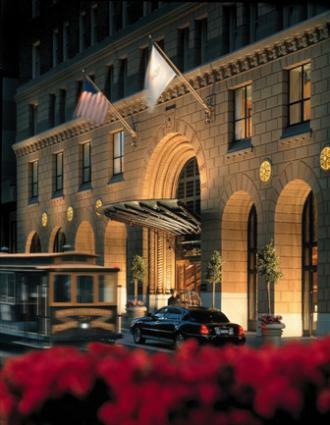 This beautiful 800+ room hotel is right on the Bay, across from the Ferry Building, and it's surrounded by the Financial District and all the shops and restaurants of Embarcadero Center. Each room has a bay or city view, a very large flat screen television, and a comfortable work desk area. The Hyatt also has excellent fitness facilities in-house, as well as a Fitness Concierge who can assist with tips on where and when to walk, jog and bike on the nearby paths of the Embarcadero. Room rates are very competitive, and many package deals are available. The base rate for a standard room runs about $394. This is a popular hotel for conventions and events, so be sure to make your reservation early for the best deals. The Omni Hotel is a large and accommodating hotel in the Financial District that has a helpful staff, luxury amenities, and a lot of extras.The hotel is also 100% non-smoking. J.D. Power and Associates gave the hotel their "Highest in Hotel Guest Satisfaction Among Upper-Upscale Hotel Chains" award in 2012. As a guest, you can take part in a free walking tour of the city that happens every Saturday morning. It's also easy to hop on the California Street cable car that heads up San Francisco's steep hills heading west into the heart of the city. 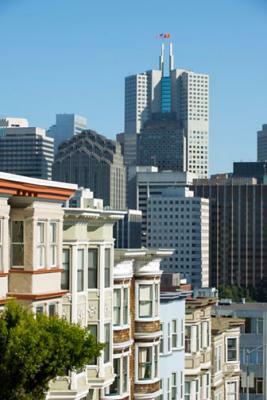 Business travelers will enjoy the proximity to San Francisco's financial and legal hub. 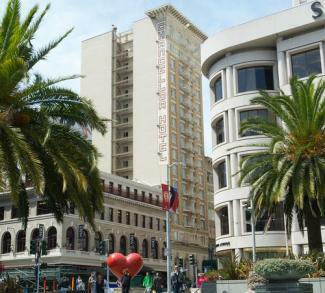 The hotel is also a quick walk to Union Square, North Beach and Chinatown. Rates can get expensive at the Omni, but it's possible to get a room for about $250 a night. If you can get your employer to pay for this hotel, do it. It is an expensive property, but the Mandarin Oriental does not skimp on service or quality. The bathrooms are oufitted in Italian white marble, and each room has a spectacular view of one of the most picturesque cities in the country. The hotel has a full-service spa, as well as fine dining options. It's situated in a great location, within walking distance to great restaurants, a theater, and sightseeing destinations. Public transportation is also highly accessible. Expect to pay about $400 a night for a basic guest room, and about $650 for one of the Mandarin's seven luxury suites. The Orchard Garden calls itself a "green boutique hotel," and part of its eco-friendly habits include saving energy and water, as well as buying environmentally responsible products. Guestrooms are decorated in earth tones, light greens, and natural wood to give a sense of calmness and tranquility. Guests can have their choice of pillows and feel good about reducing their carbon footprint by recycling in their rooms. The cleaning staff uses chemical-free products, and there is no smoking in the hotel. Rates begin at about $230 a night and can go up to about $450. For the business traveler, Club Quarters San Francisco provides a hotel experience with complimentary Wi-Fi, bottled water, workstations, coffee/tea, and newspapers. While you must be a member to stay in this hotel, the benefits of joining are reduced rates, a quiet atmosphere, and high-quality service. Rates start at about $150 a night. The Galleria Park is a four-star hotel conveniently located in the heart of the Financial District just off of Market Street. Hotel amenities include a complimentary wine hour, daily coffee and tea service, valet parking, and a quiet hour beginning at 11:00 p.m. You'll want to check out the hotel's "secret garden" that has its own walking track. The hotel also offers free Wi-Fi. Rates average about $430, so be sure to check the discount travel websites to find the best deals. South of Market is home to the Moscone Convention Center, the Museum of Modern Art and Yerba Buena Gardens, with its ever-popular carousel. 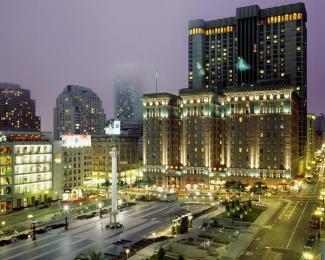 This is also the home of several of the best hotels in downtown San Francisco. Sometimes referred to as "The Jukebox'' because of its Art Deco tower, the San Francisco Marriott Marquis is frequently used by convention goers at the nearby Moscone Center. Its 1,500 rooms are frequently sold out, so be sure to book early. Even though San Francisco is a great city to explore by foot, bus or bike, there is a Hertz rental car office in the hotel if you want to get around on four wheels during your stay. The hotel also offers many special packages, including free breakfasts and coupons to local businesses and attractions like the Museum of Modern Art and Yerba Buena Gardens. Babysitting service is also available. Room rates are reasonable for an in-city hotel, starting at about $200 a night. Situated on Market Street just south of the Financial District, The Four Seasons Hotel lives up to its legacy as a destination in itself. You might never want to leave the hotel for all its amenities. In addition to a 75-foot pool and state-of-the-art fitness center, guests can enjoy twice-daily housekeeping of the well-appointed rooms. If you are traveling with kids, the hotel offers a children's DVD selection and childproofing of the room upon request. The hotel also has babysitting services. Rates can be expensive, averaging about $400 a night. 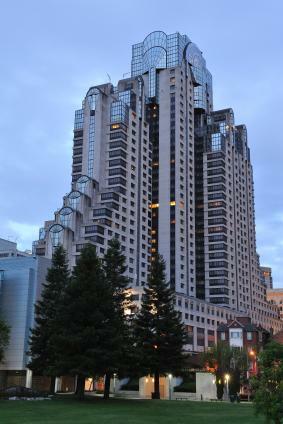 The San Francisco InterContinental opened in 2008 with 550 guest rooms on 32 stories in the SOMA (South of Market) neighborhood. 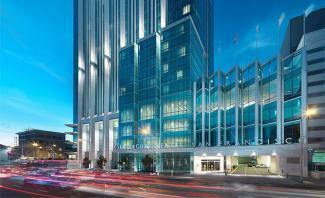 It is a nice alternative to other hotels close to Moscone Center, and it offers competitive room rates. Guests can enjoy wood and marble room decor, LCD televisions, and floor to ceiling windows providing views of the San Francisco skyline. Rooms can be secured with rates starting at $200. The stylish Hotel Zelos starts on the fifth floor, offering 198 contemporary-appointed guest rooms with excellent views. It is centrally-located between Union Square shopping and the fun Yerba Buena Gardens, local museums and the Sony Metreon entertainment center. Get fit with its morning running group, onsite fitness center or a complimentary bike rental. Then relax during a complimentary wine hour in the hotel's lounge each evening. Room rates are reasonable for a downtown hotel, at about $250 a night, and packages are sometimes available. South of Market Street can be rough around the edges at times, but not inside the Palace Hotel. Guests are greeted by an opulent lobby that leads to luxurious guestrooms with 14-foot ceilings and views of the bustling Market Street below. Built in 1909, the hotel retains its century-old charm while upgrading to modern convenience. Room rates start at about $200 and can go up to more than $400 for a suite. From the moment you walk into the lobby of the W San Francisco, you'll feel a little bit more sophisticated. Whether you choose the "Wonderful" room, the "Fabulous" room or the "Extreme Wow Suite," the W staff will work hard so you can have a good time eating and drinking your way through the city. The W has its own well-regarded bar and restaurant, as well as a lounge and 24-hour room service. Guests will also enjoy the W's featherbeds, iPod shuffles and luxury bedding with multiple pillow choices. Pets are welcome at the W, and they can feel pampered too, with their own bed, a gift at turndown service, and a litter box for cats. Room rates range from about $250 a night all the way up to $600 a night. There's a large selection of hotels in the downtown San Francisco area to serve the city's year-round tourist, business and convention needs. Room rates are very competitive, so be sure to check with hotel discounters and join loyalty programs to get the best deals.